Dark interiors have recently caught on as a trending thing. Dark palettes embody powerful attributes that suggest dignity, weight, elegance, and versatility. Predominantly dark colors set the tone for a controlled, somber mood that is best partnered with accented hardware. If you feel that dark colors look a little too ‘strong’, you can always balance out the masculinity by placing a small vase of flowers that. It is common for most artists to leverage the authoritative and powerful aura of dark palettes to evoke stronger emotions. Using dark furniture is a great way to bring an air of elegance and sophistication to the interior design. Just be careful to not flood the room with too much dark, otherwise its novelty will soon get worn out due to the heavy saturation. 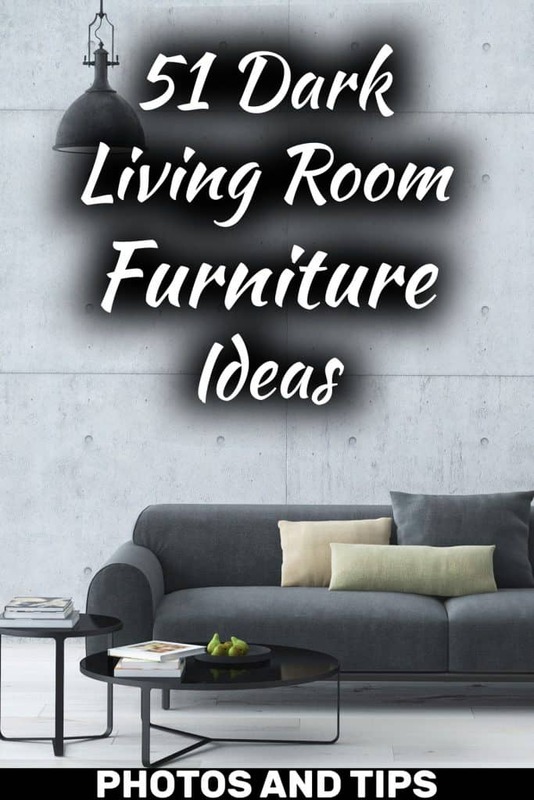 If you’re looking for dark furniture living room ideas but don’t know where to start, we’ve rounded up 51 awesome ideas that will give you a head start. Here’s creative way to juxtapose two neutral colors against small pops of color that will instantly draw your guest’s attention. This perfect combination works well during both night and day. The dark shade provides a cocooning, enveloping feel that helps the brain relax and unwind after a long day at work. Black and grey colors are currently in vogue, and for good reason. The two colors work in symphony to enable the rest of the color chart to make a statement. In interior arrangements, both colors make us feel more welcome because they add depth and warmth to create a pleasant rustic effect. High-quality prints now enable faux brick wallpapers to replicate realistic brick effects that give the illusion that there are textures on the wall. The white luster creates an airy appearance that is quiet and pure. Dark furniture with accented throw pillows provides further context to the room. A great way to maximize your room’s aesthetic appeal is by making use of straight, clean lines and a neutral color palette. You can even things out by decorating the middle of the room with brilliant pops of colors. In this case, we have pairs of orange, red, and green complementing the pitch black furniture. Dark grey tufted couch with striped throw pillows and an eclectic lamp provide an illusion of spaciousness. Meanwhile, the green shrubs overhaul the interior décor, making guests feel pleasant. Green colors are known for their positive psychological appeal. The artist strategically placed the bright yellow sofa safely cocooned the dark couches. 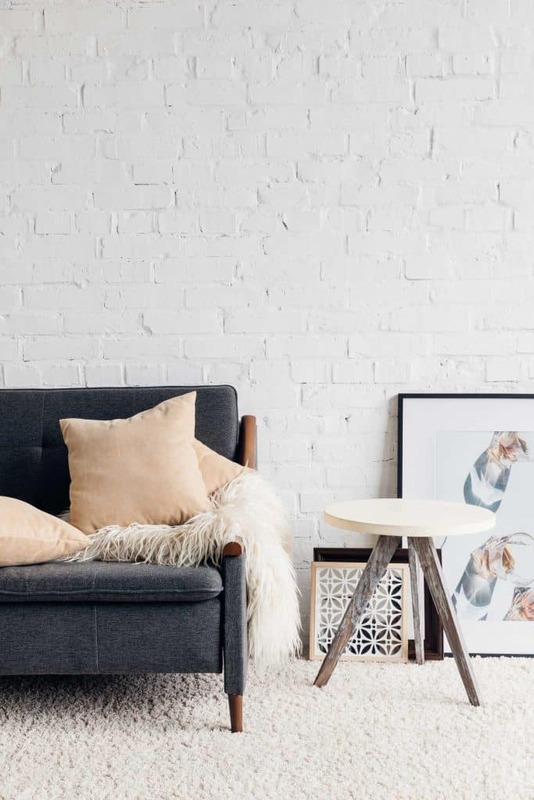 Meanwhile, the faux brick wall provides rustic comfort into the room, providing an almost vintage appeal. Any guests that would sit on the accented cough will feel special, at least until they’re asked to get up! Every color has its own impact on the elements it comes in contact with. Brown, for instance, induces a feeling of comfort and naturalness to the home. Complementing brown with neutral colors will provide your guests with a welcoming and warm ambiance, and as they step into your room, they’ll feel at ease. 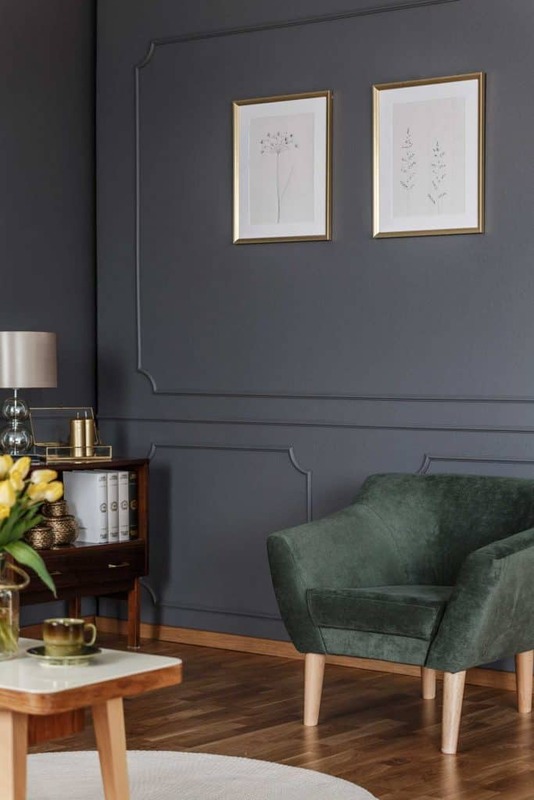 Give your living room a completely new look with navy blue furniture that will go along very well with different splashes of colors ranging from white tons, light hues, and pastel tints, to brilliant red, and lustrous orange. In this case, the artist chose to go with a more subtle choice – brown faux wood floor. If you’re feeling shy of vibrant colors and want to go with a completely subtle design, perhaps to display a more professional, somber look, then go with predominantly brown colors. Different shades of brown, if used wisely, can complete your interior room without looking too bland and simple. It is a simple, post modern contour chair that should go well with most rooms. The general idea is simple, to balance out the neutral grays using the green accent of the chair. Using purple colors is a bold, unconventional design choice that can add a big design effect, thanks to the fact that purple hues are still somewhat of novelty. Just a tiny splash of purple is enough to infuse the room with life. Layer the purples with neutral colors throw pillows for a more personalized room. Dark grey couches stand out from the noise due to their extreme versatility from a purely design standpoint. This room packs a ton of color into a tiny amount of space, and everything from the fluff underfoot to the faux wood table has a purpose. All design elements in this room share a dark color palette to ensure consistency throughout the spaces. The only change in the visuals is the bright shafts of light permeating into the room through the open window, brightening up the space. This room is packed to the brim with lots of hardware that almost dwarf the relatively tiny rug, which is bordered by that the tiny rug at the center almost looks like a tiny island. Each throw pillow is arranged in random patterns, creating the illusion of space. Colors don’t have to patch with each other, they just have to look ‘good’. In this case, the different shades of furniture perfectly complement the orange-accented throw pillows. An amalgam of grays that are balanced out with the powerful pop of orange never looked cooler until we saw this picture. Black is the classic go-to color for modern living. It pairs perfectly with different shades of grey, green vegetation, and the tiny little rug underneath. In fact, the green plantation is the one good thing that helps the sumptuous interior décor stand out. 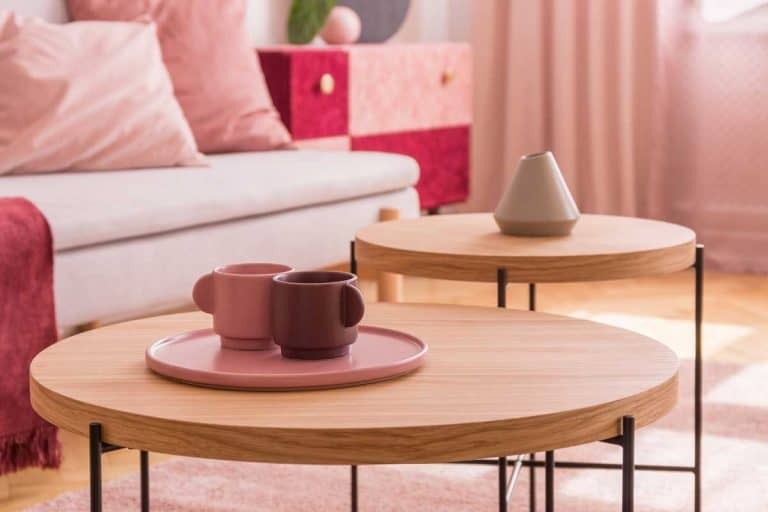 Those inspired by Scandinavian designs will fall in love with its minimalism and functionality all over again. 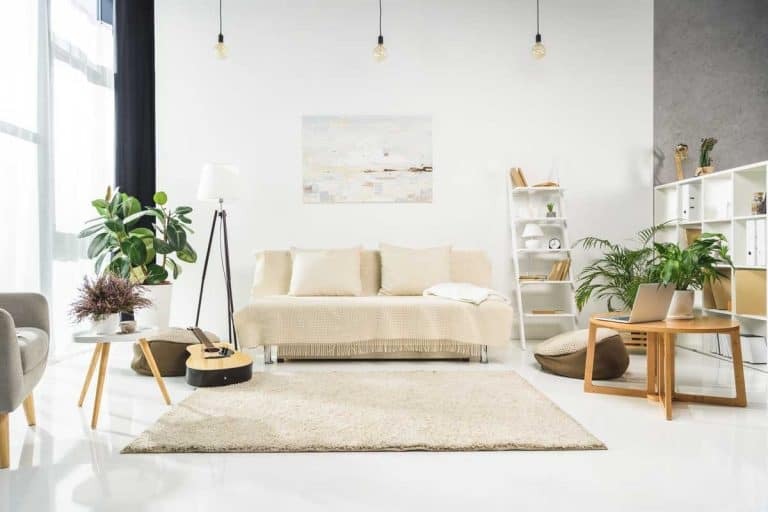 A single cursory glance at this room should highlight the power of Scandinavian design, with its neutral colors, purposeful furnishings, and aesthetically appealing straight lines. The furniture in this living room features neutral colors, including the grey fluffy rug. Meanwhile, the white walls provide the perfect backdrop to the eclectic wall. The faux wood panels behind offer some balance to the strong splashes of white. 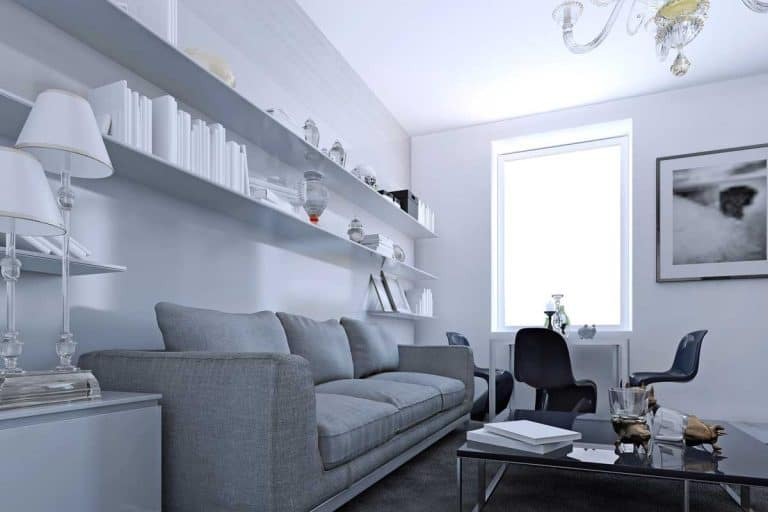 Soft whites are known to pair up well with grey sofas to capture elegance in a unique way. A splash of black is used to spice things up with for added effect. The entire room is free of elaborate patterns, with everything being Scandinavian instead. Adding some life to the room is the tiny splash of green in the far corner of the room. The orange walls imbue the room with a warming effect. Imagine walking up to the room and being greeted with the lustrous orange backdrop. The grey furniture is almost invisible to the eye, but that is what it’s designed to do. Adding extra luster to the room is light from outside. Gray colors can overhaul any living room and add tons of flair to the spaces without drawing in too much attention. A great way to take advantage of this effect is by dark furniture that has a darker hue of color. Top it all off by placing bright throw pillows in a random, haphazard pattern. You know the interior designer knows their craft well when they pair up eclectic burlap throw pillows with neutral colored furniture. Extra luster is added into the living room by the clever use of orange wallpaper. Meanwhile, the brown wooden tale completes helps the color palette with its own charm. This room is as far away from minimalism as possible. The couch contours with visible arches while the tufted back invites people to spend a cozy afternoon. The visual aesthetics of the room are further uplifted by a random mishmash of murals, a collection of memorabilia by the owner perhaps. The cozy dark furniture is located smack dab in the center of the room. A few accented throw pillows with lustrous geometric patterns steal the show by adding tremendous flair to the room. It wouldn’t be possible to add the extra flair to the living room without the light shafts flooding into the room. The dark navy blue furniture looks almost invisible against the splash of the green backdrop. Both throw pillows detract from the predominantly dark theme for a fuller experience. The dark rug beneath provides adequate cushioning to underfoot. Who says that basements have to look dull and ugly? Well, this picture provides a unique spin on the archetypical basement, and it comes complete with dark tufted couches, reclining couch, accented throw pillows, and some navy blue walls for extra measure. It does look pretty good as a living room. This living room is designed ground-up to please and stimulate the senses. It provides a good excuse to start a conversation with each other. 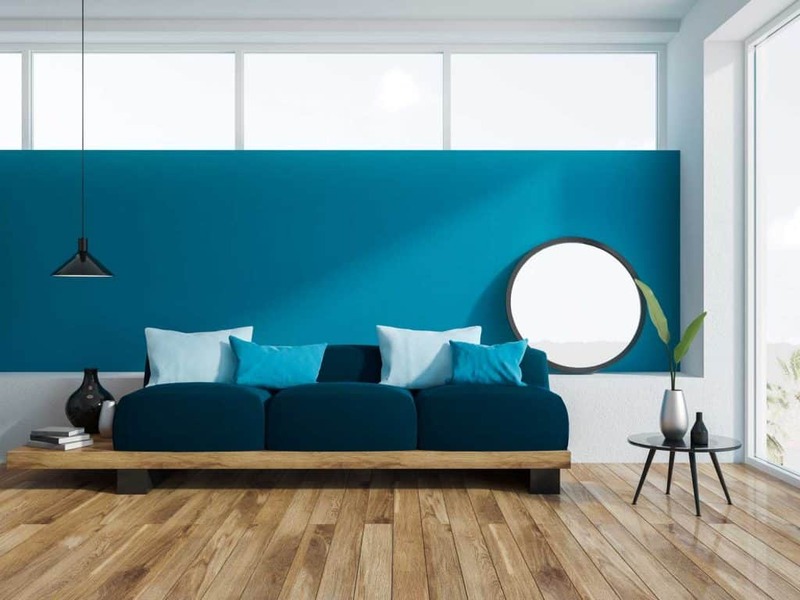 There’s a versatile and vibrant color palette that adequately powers up the room with lots of flair. It has been proven that greenery and vegetation stimulate the mind and uplift one’s mood. This room takes advantage of the science behind the reward based mechanism of the human brain. It’s pretty impressive how the black furniture is paired up so perfectly with the green vegetation. 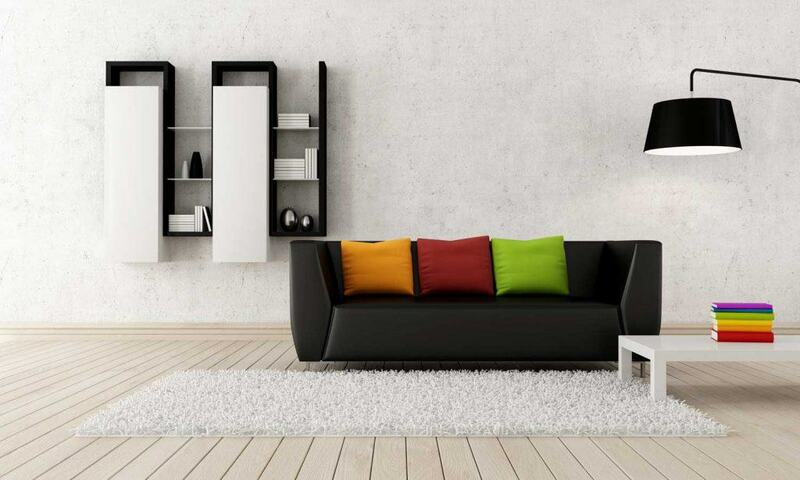 The three most popular colors used in interior décor are a combination of black and white. In this case, this living room takes advantage of them both. The black couch invites you to sit on the cushioned padding and drift into your own thoughts as the rest of the day unfolds. Grey isn’t synonymous with joy and energy, but in this case it most definitely is. It was a great idea to balance out the overbearing grey palette with the small splash of grey. Meanwhile, the rustic throw pillow provide additional luster to the room. 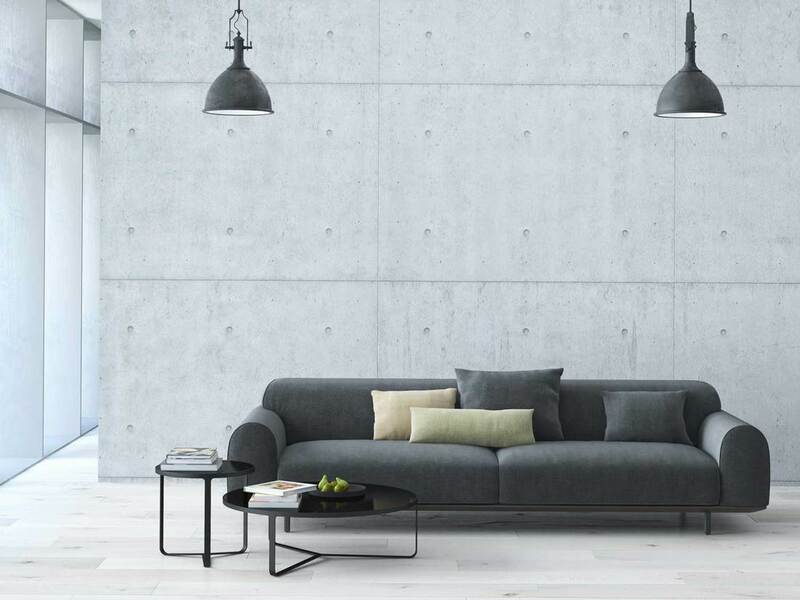 You can pair the grey couch with any combination of accent colors to make the room standout. In this case the ornate candle holders are doing a good job of creating an almost retro-esque feel to the room. A burlap throw pillow brings its own flair into the room with minimal effort. The leatherette upholstery is polished and has a very lustrous shine to it. This living room itself lacks any bright colors, which helps to make things look warm and cozy. When used on its own, black furniture really doesn’t stand out much. In fact, it disappears and fades away into the white backdrop. As a result, the dark furniture needs something brighter to create a more scenic and bright décor. The lamp in the background does manage to hold its own against things. If you want to impress your visitors, then it doesn’t harm to spruce things up with an artistic mural which has neutral colors. 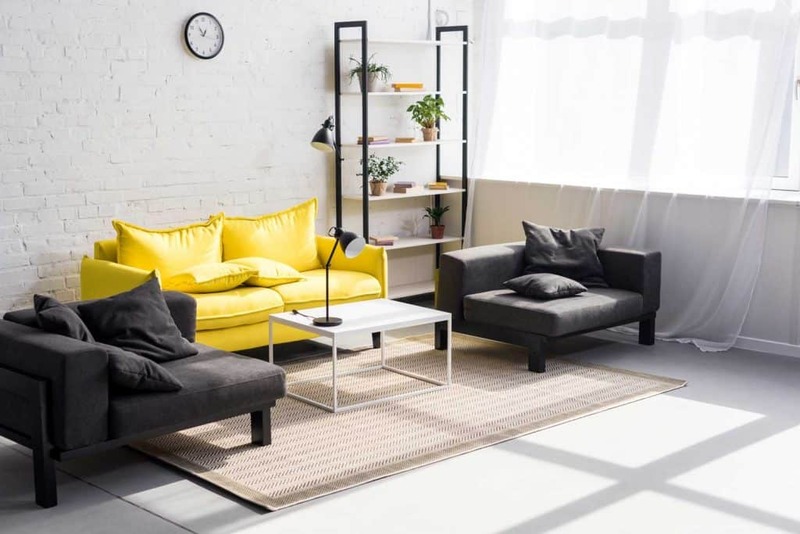 The complete lack of any bright colors is an impressive and bold decision, with the only ‘colorful’ accessory in the living room being the low-maintenance plant with a splash of green. 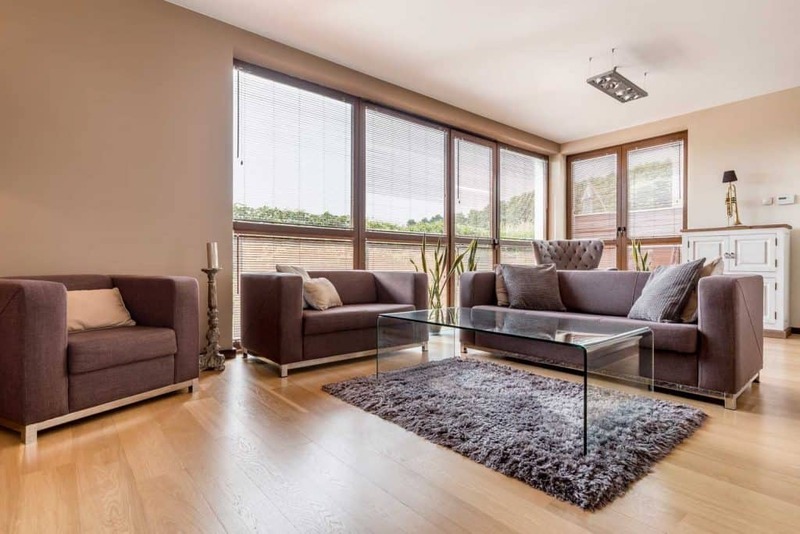 To be fair, this living room is larger than other living rooms out there, allowing the owner to experiment with different design elements at will. The eclectic velvety throw pillows are a nice touch that prevents the room from appearing too dark. It’s easy to swap out the velvet throw pillows with different colors. 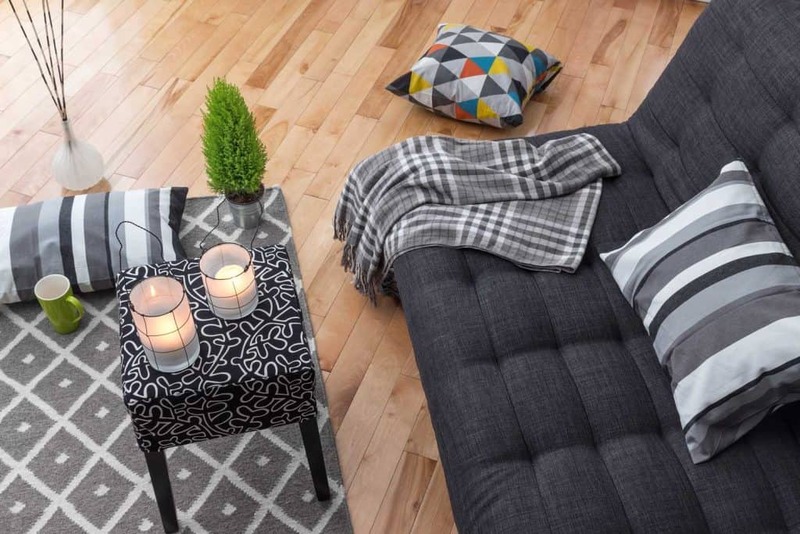 Wood is one of the most versatile materials for home decor due to its cozy, timeless, and chic appeal that can add flair to just about any space. The storage cabinet has an ornate design structure while the walls themselves are completely wooden, or at least it appears to be wooden. This chic and shabby dark themed living room doesn’t need any vibrant splashes of color. It would lonely detract from the overall experience. Besides, the main attraction of the living room is the collection pieces at the center of the living room. Your attention just draws over to the murals at the center. A summer house with white walls and giant windows allows natural light to flood into the living room, brightening up the space as they do so. Meanwhile the black furniture is complemented with light throw pillow, creating an airy, cozy space. This living room may not be for everyone because there are hundreds of accessories spread all over. Depending on your taste, you might fall in love with the assortment of hardware here, thrown in purely for aesthetical reasons. The dark furniture is balanced out with a collection of rustic throw pillows. Cool. If you’re not the kind of person who likes bright colors, then this living room is for you. It combines all the different shades of neutral colors and makes something truly innovative. We failed to find any reds, greens, yellows, or oranges – all colors which are hallmarks of modern interior design. If you want to truly personalize your room, then try attaching portraits of your loved ones on the wall. It’s a great way to bring more colors into the room to spruce things up in a subtle way. 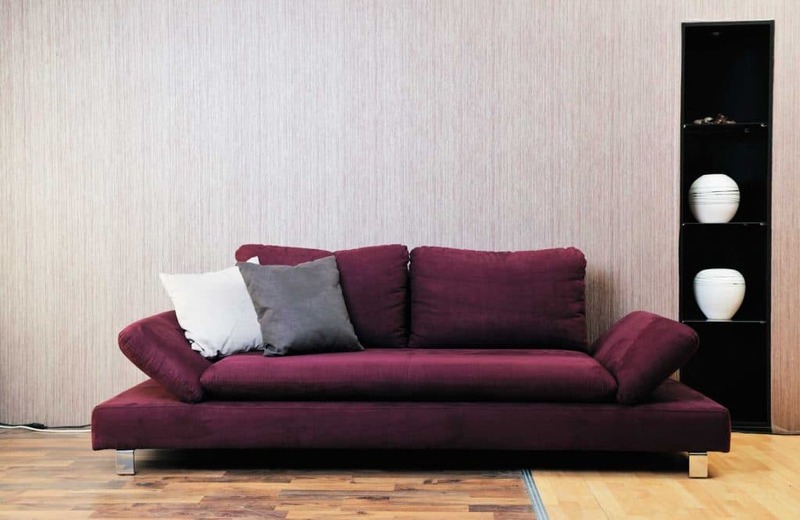 The couch is arranged such that it creates a welcoming space that instantly makes your guests feel at home. This large living room embodies money and showing off in general. If that’s the way you roll, the more power to you. The dark textured wallpaper on the walls can be sourced from Amazon. Those chic chandeliers might cost you a fortune. All in all, this room isn’t going to be easy to mimic. The dark furniture is a nice touch in this colossal living room which is probably thrice the size of most living rooms. This however allows the owner to add as many design elements as possible without looking too forced upon. Each accessory in the living room has a purpose, including the throw pillow. This living room is as very minimalistic in terms of design, with the artist going for a more functional. The dark furniture is balanced out by grey washed walls and accented throw pillows with versatile colors. The resulting space is perfect if you simply want to unwind after a long day at work. Now this is a proven color pattern we can definitely vouch for. Grey colors are versatile enough to be used anywhere, and their neutrality can be balanced out by any choice of color. You could pair it with red, orange, blue, and green colors for added flair. The brown throw pillows are a great choice. If you want to make your wall look more chic, why not go with something more ‘nontraditional’? The unique murals on both walls are a great example of adding a more modern, textural feel to living rooms with minimal effort. This living room embodies all the design elements of a Scandinavian décor with clean lines added to for aesthetic flair. There are lots of throw pillows paired with the furniture for guests to feel extra comfortable. Floral patterns are a great addition to this living room. The grey furniture in the living room has an enhanced appearance due to the accented throw pillows which add a ton of flair to the living room. One more idea to make the room look more eye catching is the comfortable looking plushy rug which will feel comfortable to your underfoot. If you’ve run out of ideas about overhauling your room’s design, take a cursory look at this living room: pops of red. Red is your answer when it comes to sprucing up just about anything. Just make sure the room already doesn’t have vibrant colors, otherwise the red color may end up looking lackluster. Faux brick wallpaper always looks perfect, imbuing the room with an industrial rustic style that goes well with most accessories. Another detail in the living room is the grey curtains that have been opened to let natural light in. It’s mesmerizing how peaceful the room looks. Want to add some more flair to your living room? Why not buy some throw pillows to create a more vibrant atmosphere? In this case, the red-hued spotted throw pillows are playing their role well in spicing things up. All in all, the muted colors are doing a spectacular job at overhauling the living room. Can a Coffee Table be Higher than a Couch?